mundane jane: I can't help myself. Really. I can't. I can't help myself. Really. I can't. This NPR teaser sounds more like me than the post I actually wrote. I think somebody at Morning Edition is copying me. I gotta get Nina Totenberg on the line. 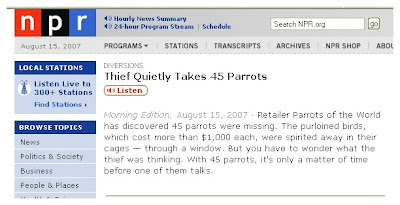 I love it when NPR scoops everyone else. This story was on my Yahoo home page this morning--two days after NPR.